With over 50 years of performing experience, Michael "Hawkeye" Herman exemplifies the range of possibilities in acoustic blues, and personifies versatile musicianship, originality, and compelling artistry as a blues storyteller. His dynamic performances have won him a faithful following, and he leads a very active touring schedule of performances at festivals, concerts, school programs, and workshops. Hawkeye performs a wide variety of traditional blues, ballads, swing, and original tunes, on six-string and twelve-string guitar, and is an adept and exciting practitioner of slide guitar and slide mandolin. His music has been included in video documentaries and in three hit theatrical productions, and his solo CD, Blues Alive!, released in 1998, was greeted by rave reviews and greatly increased the demand for his live performances at major blues and folk festivals. His newest CD, It's All Blues To Me!, was released in May of 2005. Hawkeye was born in Davenport, IA, on January 11th, 1945. As a teenager, he discovered a broad variety of blues music in late night radio broadcasts from Memphis, Shreveport, Dallas, New Orleans, Little Rock, Chicago, Detroit, and other points beyond the Iowa/Illinois Quad Cities, in the upper Mississippi River Valley area where he was growing up. Hawkeye got his first guitar in 1959, at the age of fourteen, and was performing two years later. Seeking to broaden his musical horizons, he relocated in the San Francisco Bay area in 1968. He sought out, and learned at the feet of many icons of the blues, including: Son House, Brownie McGhee, Bukka White, Mance Lipscomb, Furry Lewis, Lightin' Hopkins, John Jackson, K.C. Douglas, and Sam Chatmon. He became a staple in the Bay Area blues scene as both a solo artist and a back-up guitarist and worked with Charles Brown, Haskell "Cool Papa" Sadler, Sonny Rhodes, Jimmy McCracklin, Buddy Ace, Charles Houf, Little Joe Blue, Boogie Jake, and many others. 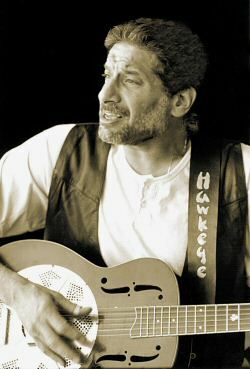 Hawkeye began touring outside of California in 1984, and has performed at blues and folk festivals, and in concert, across the US/Canada and Europe. His dynamic performances have won him a faithful following and he leads a very active touring schedule. Hawkeye performs a wide variety of traditional blues, ballads, swing, and original tunes, on six-string and twelve-string guitar, and is an adept and exciting practitioner of slide guitar and slide mandolin. His 1989 album, Everyday Living, featuring Charles Brown and Cool Papa, received much critical acclaim. His song, The Great Flood of '93, has been used on the sound-tracks of two video documentaries on that Midwest disaster, and has been included in a compact disc anthology of singer/songwriters produced by the New York based music magazine, Fast Folk. As a music educator, Hawkeye has taken his love of blues music to students of all ages, from pre-school to university campuses through his enthusiastically received "Blues in the Schools" programs, which he initiated in 1980. He has taught guitar for over 25 years, and has presented blues and slide guitar instructional workshops at major folk and blues festivals as a part of his frequent concert touring schedule. In May of 1998, Hawkeye received the "Keeping the Blues Alive" Award for achievement in education from the Blues Foundation in Memphis. The award was the result of many years of blues educational programs he has done for students of all ages. He began this effort long before most blues support organizations and blues festivals even existed. Hawkeye has helped to initiate in-school educational programs for many blues societies and has single-handedly introduced blues music workshops to major festivals. He is the co-founder of the Rogue Valley Blues Festival in his home area of Southern Oregon. Hawkeye was the composer/musical director/musician for the hit play El Paso Blue, which has had successful runs in San Franciso, Seattle, San Diego, Chicago, Portland, at the Kennedy Center in Washington DC, Philadelphia, where he was awarded the prestigious Barrymore Theater Award for Best Original Music in a play for the '99/'00 season, and at the Oregon Shakespeare Festival in Ashland, OR, the largest theater complex in the US. In 2004, Hawkeye performed off Broadway in the New York City production of El Paso Blue. He collaborated with Pulitzer Prize-winning playwright Robert Schenkkan on the music for the 2002 West Coast premiere of Schenkkan's play, Handler, also produced at the Oregon Shakespeare Festival. Hawkeye served for six years on the Board of Directors of the Blues Foundation in Memphis, and was chairperson of the Foundation's education committee. He has contributed blues historical articles and personal memoirs to many national and regional blues magazines, as well as contributed to the recent book/CD anthology, Up the Mississippi/A Journey Of The Blues, published by the Mississippi Valley Blues Society in 2003. Hawkeye has provided musical soundtracks for a number of video productions, most recently, Tying Bob Quigley's Signature Flies / Volume One (Pegasus Productions). Hawkeye served for six years on the Board of Directors of the Blues Foundation in Memphis, and was chairperson of the Foundation's education committee. He maintains an active touring schedule performing in concert and at blues festivals throughout the US/Canada/Europe, and his original articles about blues history appear in numerous national and regional blues magazines and newsletters. In November of 2004, Hawkeye was inducted into the Iowa Blues Hall of Fame in Des Moines, IA. In September of 2005, Hawkeye composed "Katrina, Oh Katrina (Hurricane Blues)", detailing the hurricane disaster on the Gulf Coast, at the request of the British Broadcasting Company (BBC). The song was aired to over 7 million listeners on BBC Radio news' "Today" program. This musician has definitely carved out a spot for himself in the contemporary acoustic blues/folk field, and has earned a reputation as one of the most accomplished artists in the genre. Michael "Hawkeye" Herman has been called "The Midwest's Blues Ambassador," and audiences throughout the US/Canada/Europe have come to know and appreciate Hawkeye's talent, dedication, and captivating performances.